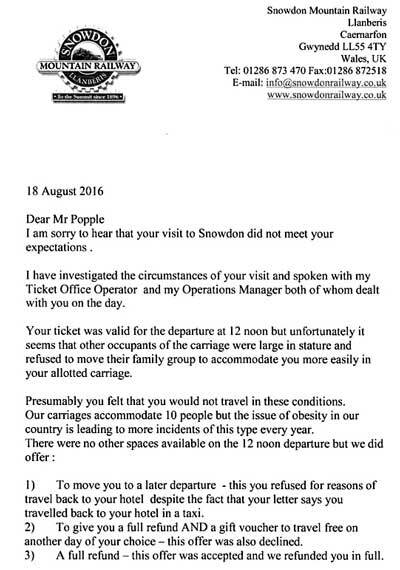 A tourist who booked a ride on the Snowdon Mountain Railway in Wales was turned away because there were too many fat people on board. And bosses told a bitterly disappointed Anthony Poppel it was not the first time obese passengers had taken up all the available space. 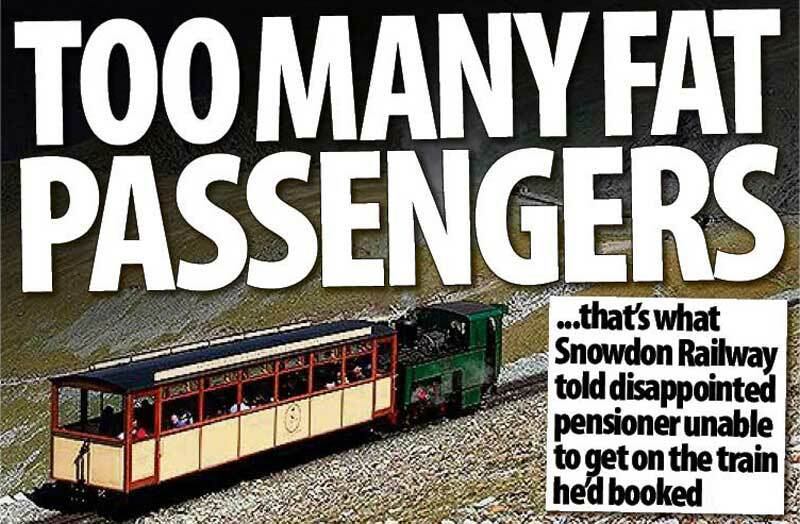 The pensioner was looking forward to his trip on the railway after travelling from his home in East Anglia to North Wales. But, after booking his return ticket on the steam service, he arrived on the platform to be told there was no room. Mr Poppel had no time to re-book the trip and was given a refund. He also received a letter of apology which said: “Your ticket was valid for the departure at 12 noon but unfortunately it seems that other occupants of the carriage were large in stature and refused to move their family group to accommodate you more easily in your allotted carriage.” The letter added: “Our carriages accommodate 10 people but the issue of obesity in our country is leading to more incidents of this type every year.” A spokesman for the railway, which runs to the top of the 3,560ft mountain , said: “More than 130,000 passengers travel on Snowdon’s narrow gauge railway every year. “On the day of Mr Poppel’s visit, a family of four occupied the full width of his carriage due to their physical size and weight, taking the space normally reserved for five people. We requested that they sit opposite one another but they refused. 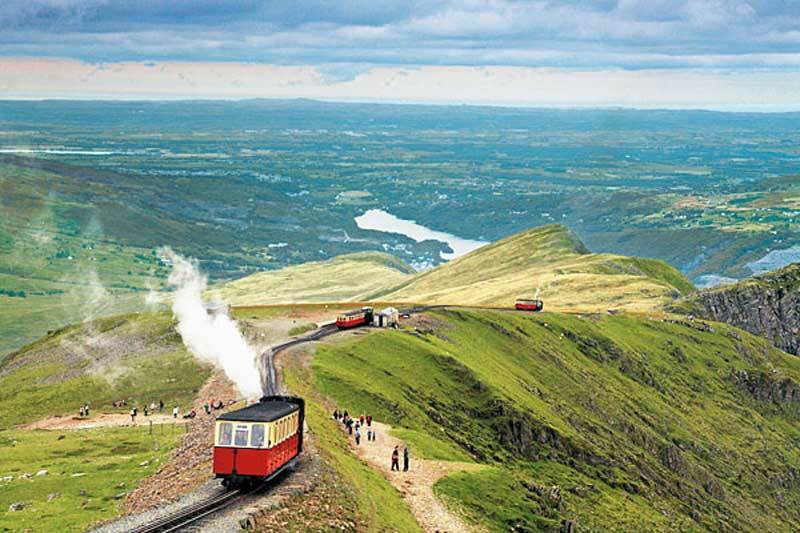 We did everything we could to accommodate Mr Poppel and we apologise for any disappointment he experienced.” Mr Poppel from Martlesham, who was on holiday in Llandudno, had arrived half an hour before the scheduled start of the 90-minute journey to the top of Snowdon . 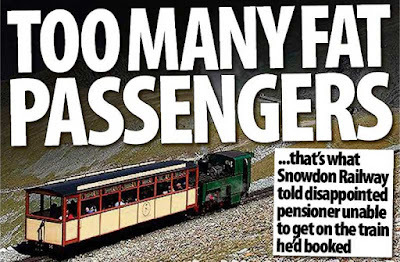 He said: “I was told to arrive there at 11.30 to pick up my ticket to get on the compartment of the one-carriage train. “But there was no space for me. It was full-up.” Despite having a reserved £32.50 ticket, those on board refused to move up to allow him on board. Mr Poppel said: “When I went to get in, there were people sitting down and several kids in there as well. The young guard who was there said, ‘Sorry, it is full’. I had to go and get my money back. It ruined my holiday really. I had travelled a long way to see it and I thought it was poor show. It was my first time in Wales and I was really looking forward to going up Snowdon.” The 4.5 mile narrow gauge railway, which was built in 1896, takes passengers from Llanberis to the 1,085m summit.